Create a templates that anyone can use for your workshops and activities. When you’ve designed an activity you want to repeat again and again, you can publish that mural as a template. When you do this, it will act as a master copy. Thus, anyone who creates a mural from that template will begin with the exact same content. Templates are not editable, so you won’t have to worry about team members accidentally changing your important murals. Anyone in your team can create murals from templates. However, only people who are specifically given permission from a team admin are able to publish templates. 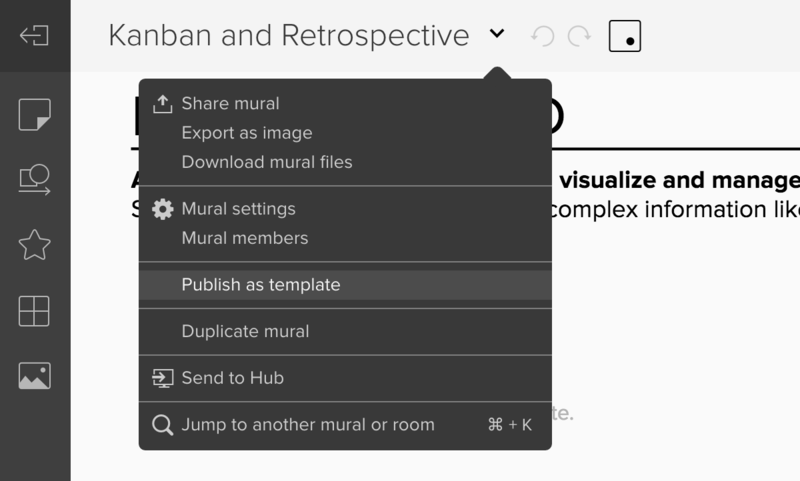 Enter a mural you’d like to publish as a template. To create a mural from a template, you can find more information about that here. Now you can rest assured knowing that your whole team will be able to complete the same activities, without accidentally rearranging content you wanted to reuse.